Crispy wafer rolls, filled to the brim with delicious sweet filling is the perfect complement to tea or coffee. The choices for toppings can be extremely varied: whipped cream, jam, honey nut mixture, condensed milk, sorbet or custard. - 1 Bank boiled condensed milk. Egg whisk with sugar. Then add the melted margarine and mix well. Without ceasing to stir, stir in sifted through a fine sieve the flour. The consistency of the dough for the wafer tubes should be as dense sour cream. Electrovalence grease. Pour a 2 tablespoons of dough and spread evenly over the surface. Close the lid and bake for a few minutes (2-5) by checking the degree of readiness. Ready carefully remove waffle from waffle iron and not allowing them to cool, quickly roll tube. Wafer rolls are stored well, they can prepare for the future – then will only have to fill filling. When all rolls are ready, fill them with condensed milk and lightly sprinkle with icing sugar. - 1 teaspoon of vanilla sugar. Beat the eggs in a deep bowl. Add the sugar, vanilla sugar and carefully RUB everything with a whisk. Melt the butter and pour in egg mixture. Mix well. Gently add sieved flour and mix – the dough should not form lumps. Grease heated electrovalence small amount of vegetable oil. Pour a bit of dough (about 1 tablespoon) and flatten the surface. Electrovalence, tightly close, crushing both edges, and bake for about 5 minutes. Ensure that the waffles were not overcooked, otherwise they will be tasteless. Ready hot waffle quickly rolled into a tube, as the cooled wafer to give any form will not succeed. In the same way prepare all the rolls. Whip the egg whites, gradually adding powdered sugar. Continue whisking until then, until a thick stable foam. 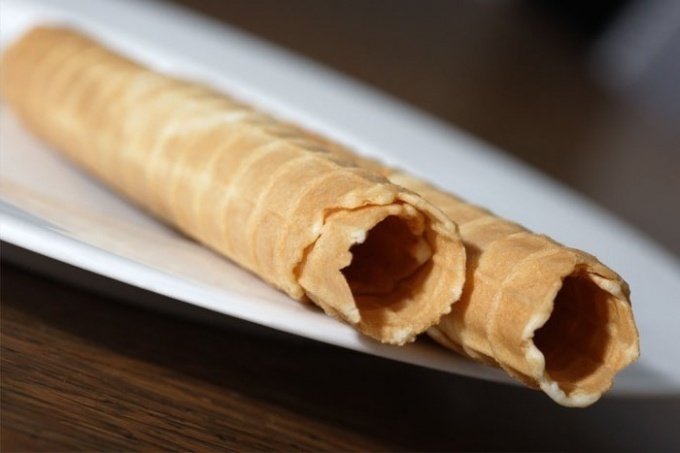 To filled wafer rolls with a cream, use a pastry bag with a nozzle "star". Alternately fill protein cream all tubes.